The coldest weather that we’ll get here is probably rainy season, which is reason enough for a good, hearty bowl of soup. Ironically, some studies have also found that eating hot food can actually cool you down in hot weather. That would explain why we get cravings for tom yum or mala even when it’s very warm out! 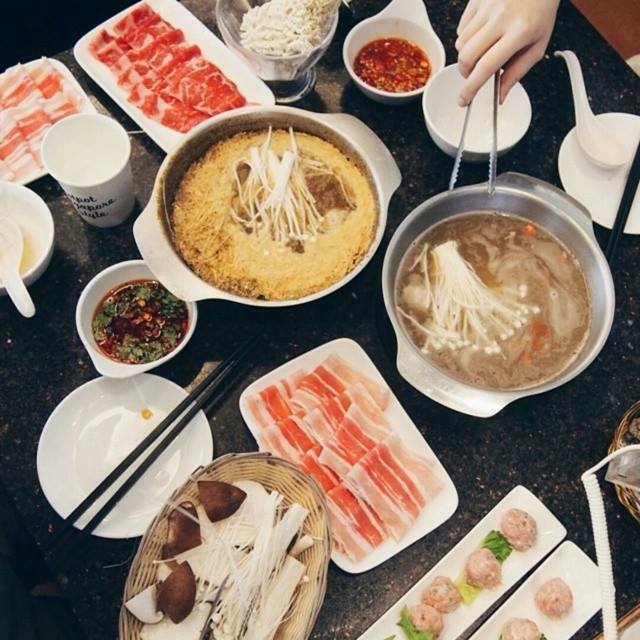 Hot or cold, here are 10 of our favourite hot pot places, for groups of all sizes and budget. 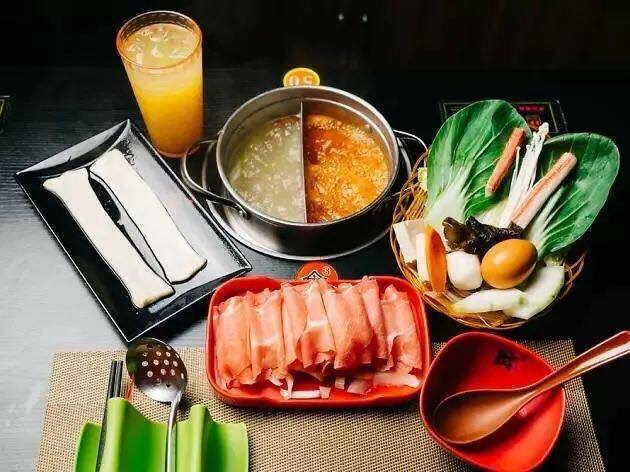 If you’re dining solo and craving hot pot, there’s also a place that has an affordable individual hot pot set where you can even choose two different soups! You can’t have a hotpot list and not include Hai Di Lao. The hot pot chain from China is renowned for its super spicy mala soup and its excellent service. Oh and that “flying noodles” performance all over social media where your waiter will use your noodles as ribbons in a dance before dropping it in your soup. Choose up to 4 different soup bases, and select your meats and garnishes from the menu. Hai Di Lao’s specialty is their Sichuan mala soup, although there are other non-spicy options like chicken soup and mushroom soup. There is no buffet option, so gather your buddies to order a wider variety of dishes. Dining here isn’t cheap – expect to spend at least $50 per person, more if you’re getting alcohol. Hai Di Lao is also known for its long queues, which can stretch up to 2 to 3 hours during peak hours on the weekends. There are services offered by the restaurant to make your waiting time less boring like manicures (expect a queue for that too), eating watermelon, or even getting a massage. We were told that you can even change your screen protector too. To beat the queues, try going during off-peak hours. Another popular mala hotpot place that has recently arrived in Singapore is Spice World. 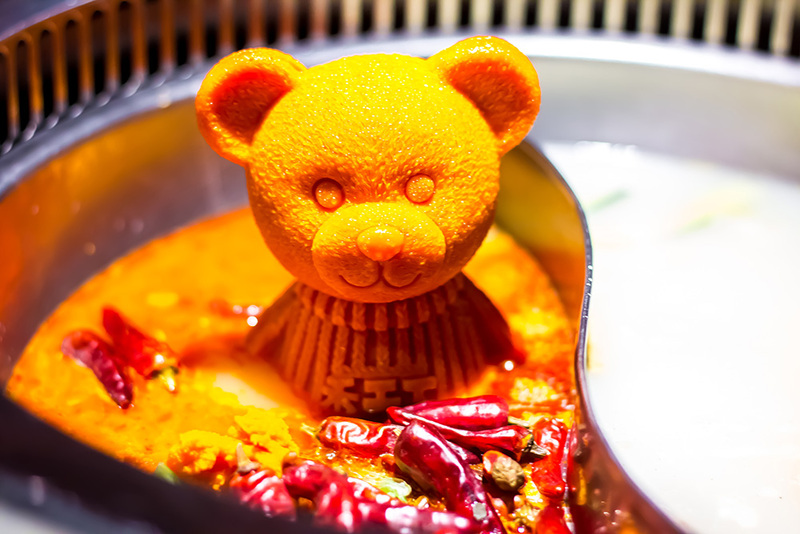 This hotpot chain is more famous for their mala butter, which comes in the shape of a cute teddy bear or a Hello Kitty and melts into the broth as it boils. Their signature dishes include the Barbie Wagyu, where your beef arrives at your table draped all over a Barbie doll and the One Metre-Long Mutton Slices, which is a one metre long plate lined with mutton slices. Novelties aside, Spice World’s soups are really good and the mala is spicy enough to make your stomach hurt. Pair it with the Pork Belly And Chicken or the Wild Mushroom Soup to balance out all the spice. Their seafood and meats are fresh, and their side dishes and appetisers are pretty decent too. Spice World is also on the higher end of hot pot restaurants, so be prepared to spend at least $50 per person, and budget for a little more if you’re dining in smaller groups. The hot pot restaurant is also conveniently located at Clarke Quay if you’re looking for a place to sober up after a long night of drinking. The latest hot pot restaurant on the block is martial-arts themed, down to the dishes. Inspired by everyday heroes, SG Hot Pot Heroes is all about the positive energy behind individual heroics. 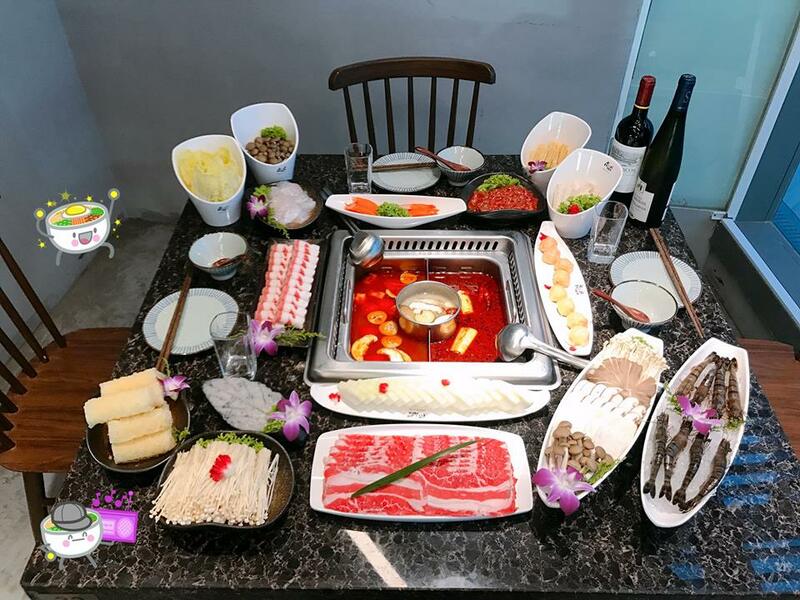 We’re not quite sure how being a hero has anything to do with hot pot, but the restaurant knows a thing or two about presentation to get onto Instagram. The meats dock at your table in an old-school Chinese barge, complete with smoke coming out the sides. The Tai Ji Ba Xian Guo Hai (seafood platter) is named after the Eight Immortals, and you’ll dine with all 8 of them as they are the ones overseeing your seafood platter. Build you own pot from the ala carte menu, or order their sets which come with a mix of veggies and meats to make dining easier. 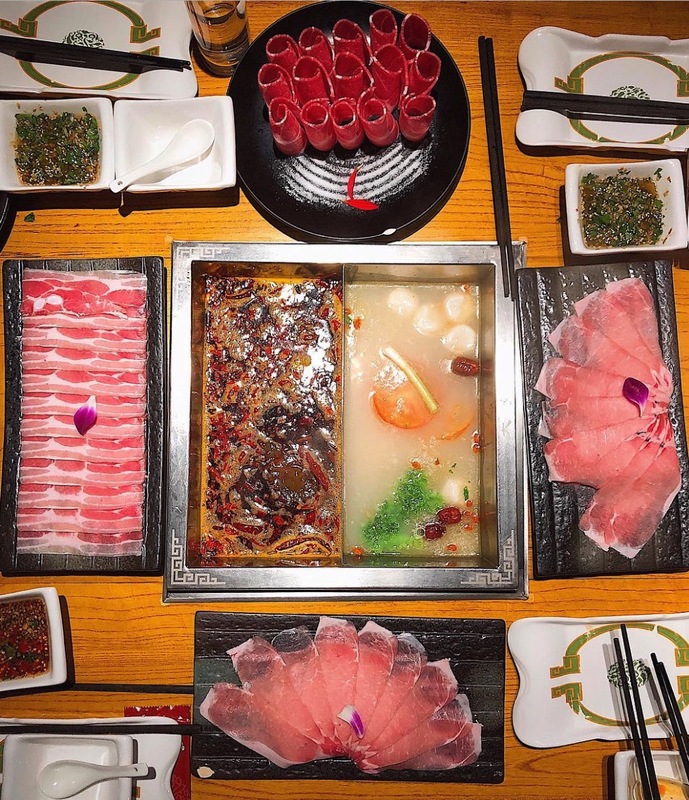 One of their bestsellers is the Chongqing Mala Broth With Quality Beef Oil, with other specialty broths like the classic Sichuan Mala Broth, Ermei Beauty Collagen Broth, and Wutang Mushroom Broth. 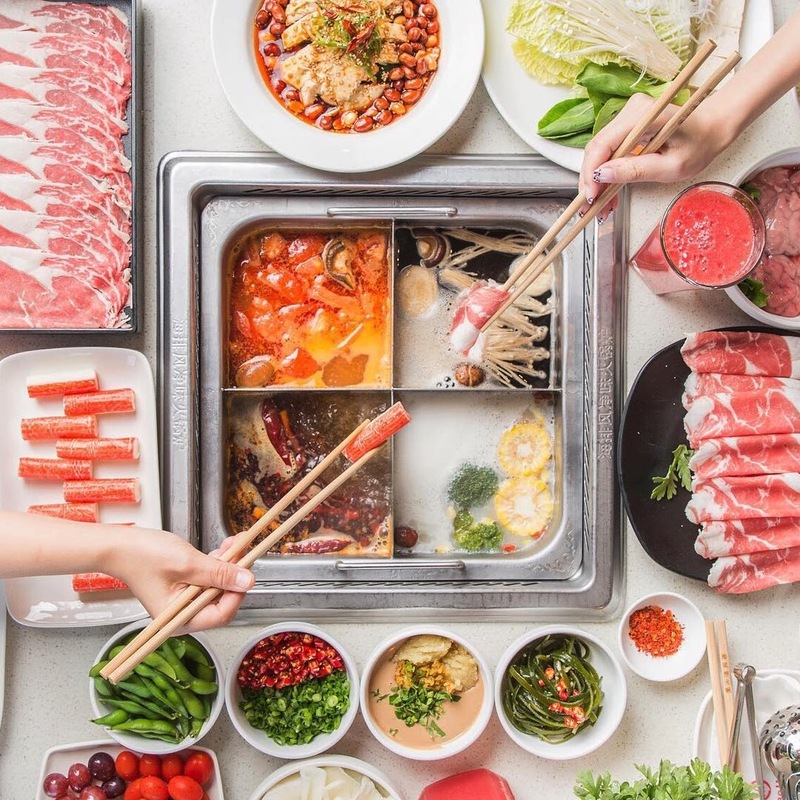 The founder of Hot Pot Heroes is also the owner of Eel Hotpot, yet another famous hotpot restaurant with over 200 outlets in China, so you can be sure that you’re getting top-grade, authentic hot pot broths. You can’t complain that your seafood isn’t fresh at New Thai Tanic because you get to catch ALL your seafood from a tank before cooking it right at your table. From tank to table, now you can actually complain that your food is taking so long to arrive because you’re still trying to catch that fish. The tanks that house the live seafood is right next to your table, so you don’t even have to leave your table unless your catch is swimming away from you. There’s over 50 varieties of seafood to choose from – clams, mussels, prawns, crayfish and lobsters. Be sure to get some hotate, snow crab legs and oysters while you’re at it! Other than seafood, the buffet also has beef and lamb shabu shabu, and cooked food like fishcakes and sausages that are fried-to-order. Best yet, you can even get the waiters to deshell your crabs and lobsters at your table for you. Choose from 6 different soup bases: Tom-Yum-Mala, Tom Yum, Mala, Black Chicken Collagen, Shark Fin (mock) and Abalone, and you’ve got the option of having 1 to 4 soup bases. The buffet will cost you $59.90++ per person including 1 soup base, but it’s totally worth if you love seafood! Just note that you’ll only have 2 hours to eat your fill. Rumour has it that the people behind Shang Pin Hot Pot used to work at Hai Di Lao. While we can’t confirm that rumour, we did realise that a lot of similarities – from the fresh watermelon you’re given while you’re waiting, to the mala soups and menu options, and even the flying noodles dance. You can choose up to 3 different soups (I personally love the Chicken Herbal and Tomato soups), and there’s also an option to add-on free flow drinks for $2. Shang Pin Hot Pot is a cheaper alternative to Hai Di Lao if you’re craving good hot pot without having to spend a bomb. The restaurant only has an ala carte menu, and you can expect to fork out around $30 to $40 per person. The restaurant is tucked up on the second level of Rendezvous Gallery, about a 5 minute walk away from Dhoby Ghaut MRT Station. An ideal choice if you’re on a budget but still want hot pot! Shabu Sai does shabu shabu hot pot in a buffet style. Stuff your face with as much free flow shabu shabu beef, pork and chicken for 90 minutes. The buffet also includes a drinks and dessert bar, with cooked food options like sushi and tempura too. You can only choose 2 different soup bases, but with prices from $16.99 per person, you can’t really complain. Sukiyaki, a slightly sweeter broth, is a popular choice, although it can be a little too salty. Their collagen broths are pretty delicious if you’re looking for a lighter soup option. 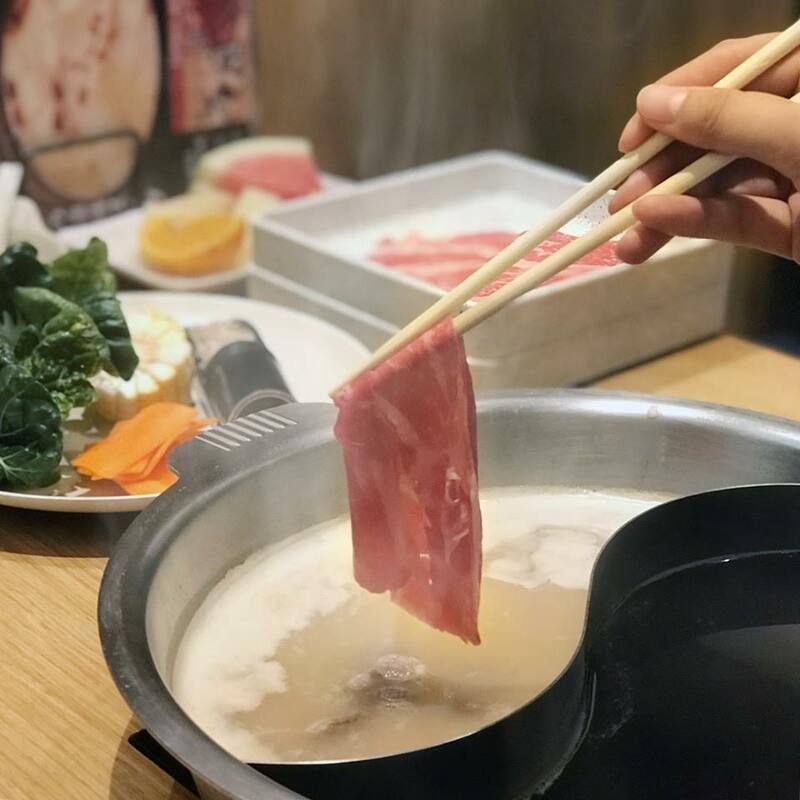 Shabu Sai has 6 different outlets all over the city, and there is one conveniently located in town at Orchard Central if you’re craving some soup after shopping. 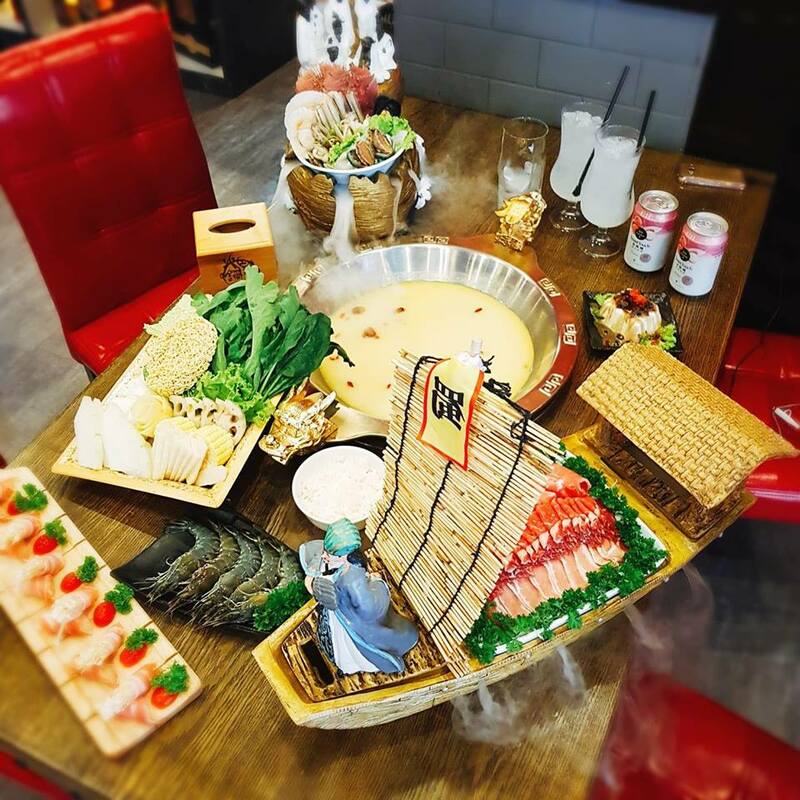 Best eaten with a group of friends, Captain K Seafood Tower is popular for their stackable towers of seafood that are both a sight to behold and for Instagram-worthy foodie pictures. How it works is that you can choose up to 9 different layers of seafood and shellfish. Fill your tower with over 90 different menu items, and wait for it to cook. Your seafood will be steamed, and the juices will slowly drip down into the pot below to season your chosen soup base. Depending on the broth you chose (Kombu Dashi, Korean Kimchi Stew or Chicken Ginseng Broth), you’re going to get a different soup depending on the ingredients you choose! “modified to local taste” level of spice too. The fun part about dining at Da Miao is not people-watching all the drunk stragglers in Clarke Quay, but the live entertainment. Be entertained by Chinese long-sprout tea pouring ceremonies and traditional Sichuan performances of “Bian Lian” when you visit the restaurant at night. Be more adventurous with your soup bases at JPOT, which has options like laksa and bak kut teh. You can even turn your soup into a chilli crab sauce with the Chili Crab Set that comes with a raw egg and cornstarch, which makes your soup more viscous. You can also choose from a wide range of meats, shellfish, and even carb options like porridge and mantous. JPOT also caters to solo diners and groups where everyone has different preferences with individual soup pots. It might be a bit ironic to have individual pots because hot pot is a communal dining style at heart, but it certainly makes eating in a group more fun. Eating hot pot alone on a budget is not impossible. Shi Li Fang is a Taiwanese hot pot chain that has cheap solo hot pot sets going at just $9.90. You can choose your choice of meat (pork/ beef/ chicken) and noodles, and even two choices of soup! Plus condiments like veggies and eggs are also included. I don’t know about you, but this is a steal in the land of hot pot. Just don’t expect the food to be of super high quality, but the ingredients are fresh and for that price, it’s a pretty solid bowl of soup. They also have bigger soup bowls for bigger groups, at the same wallet-friendly prices. 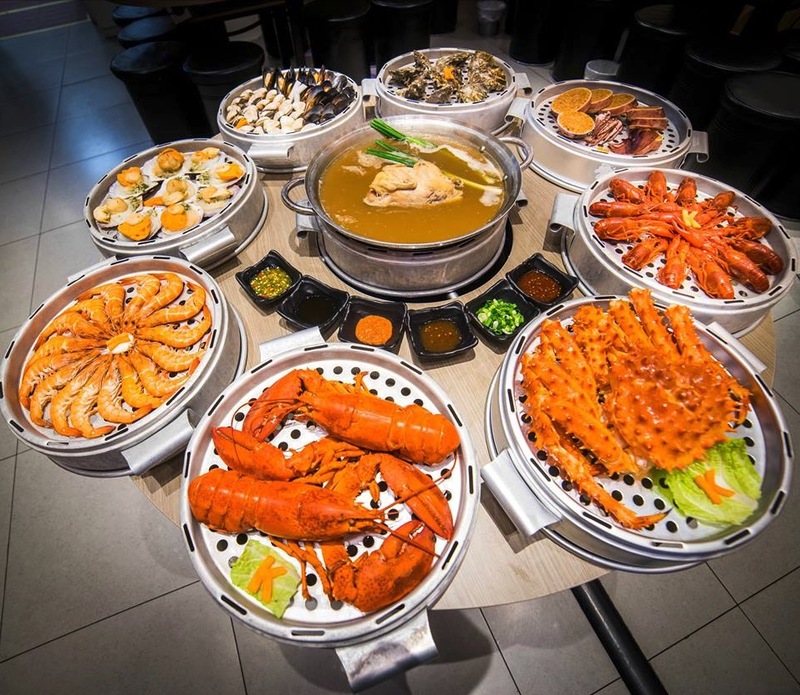 Shi Li Fang has 9 outlets all over Singapore at convenient locations like City Square Mall, Chinatown Point, and Central so you can have hot pot whenever you like.